THE AIA TOUR IS TAKING PLACE TODAY!! It is self-guided so you can visit the locations in any order. Transportation is not provided. Tickets can be purchased for $25 >>HERE<< or at any of the tour locations beginning at noon. For online sales, take your ticket with you to your first stop to get your tickets! 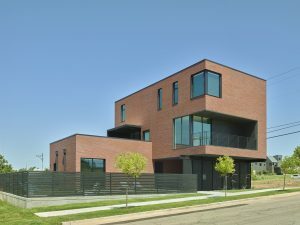 In the heart of downtown Oklahoma City, the Price Residence takes on the vernacular of a contemporary townhouse. The general massing places the main living spaces on an elevated level above the garage and a studio apartment. This elevated massing not only provides security for the family, but presents incredible downtown views from each of the upstairs living spaces. By rotating the second and third floors perpendicular to the first floor, unique outdoor spaces were created, taking advantage of exceptional views and providing shelter to outdoor terraces. Located in an urban setting, the need for a protected front door access was critical. The use of a custom metal pivot gate provides secure entry and creates a sequencing to the front door and the main entry stair. The exterior materials of the project include red brick, painted structural steel, custom metal detailing, and charred wood siding. The two different masses are distinguished by an offset in the masonry, and a deeper rake joint. The steel structural elements of the project were utilized beyond their supportive nature and re-enforced as framing for an exterior privacy fence. The charred wood siding was used to designate material change at subtractions within the form. The interior spaces were programmed to accommodate the specific needs of the family. The interior finishes include a white wash white oak flooring, white painted custom millwork, and custom ceramic and porcelain tile finishes. The finishes re-enforce the clean forms of the exterior and provide a backdrop to unique fixtures and furniture. Minimal framing details were used around window and door frames, and supported the contemporary nature of the project. The Urban Beach House is a live/work residence in the re-developing single-family SOSA neighborhood located in downtown Oklahoma City. 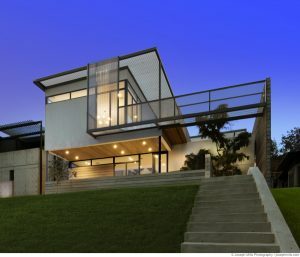 The home’s site is unique in its steep incline from street to building pad, which allows for an elegant approach up to the house in addition to an opportunity to capture an expansive view of the downtown skyline. The owners wanted to take advantage of this view from the main living areas and the private pool. With the view being from the front of the home, maintaining privacy of these areas was contradictory. The solution was to elevate the living areas and pool to the second floor, offering privacy from the street while keeping both spaces open and connected to downtown. The design of the residence relates to the eclectic style of the surrounding neighborhood, which includes several modern houses and a modern condominium. Several elements, such as the alignment of the front porch, the stair up the incline from street to entry, the alley-accessed garage, and the scale of the home are shared by its immediate neighbors, providing a sense of cohesion within the area without sacrificing individuality. The homeowner’s career in graphic design influenced the clean forms of the home, as well as the sapele wood and stucco material palette. Exposed steel structure supports the south living room and lookout deck, and the aluminum grate shade screen and catwalk overlooking the entry provide an additional graphic quality. A Dwarf Black Locust tree, growing from the front porch up through an opening to the second-floor deck, provides a colorful contrast to the neutral tones of the house as well as a natural element to the elevated outdoor areas. 701 Hudson is a 5 story condominium developement that sits on a former parking lot at the northwest corner of NW 6th Street and N Hudson Ave. This urban infill project is comprised of eleven residential units. Each of 701 Hudson’s units enjoy open spacious floor plans with sweeping views of the city center. Residents also enjoy secured covered parking and find themselves within walking distance of numerous shops and restaurants. Architect of Record: ADG, P.C. LEVEL creates a new urban typology to increase inner-city density. A four-story building shelters a central communal courtyard – divided in two by a vertical stack of four parking decks screened in foliage – while defining the city block on the outside. The building’s dark masonry podium, patterned with projecting bricks and punctuated by deeply-recessed openings, is crowned by a white-rendered stucco volume, broken down into an assemblage of rectilinear forms. 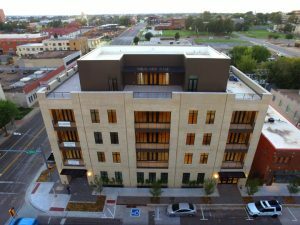 Comprising 228 one and two-bedroom apartments and over 4,900 square feet of retail space, this project offers an affordable and cost-effective new housing model for Oklahoma City, where low-density single-story homes tend to predominate. The architect of record is ADG. The design architect is Allford Hall Monaghan Morris. As a building with neither a front nor back, Mosaic unites use and activity into its sides, roof and middle. A longitudinal cut through a six-story volume opens up a central courtyard to increase views to downtown OKC and create a ‘spine’ that engages with the neighborhood. Externally, elevations take on different characters to respond to context: the northern face reflects the vertical orientation of the brownstones opposite, while the horizontal banding and ‘punched’ balconies of the south address the 2nd Street Lofts across the road and the Great Plains landscape further afield. The upper levels are clad in a custom-mixed integral sand and cement stucco with mica chips that make the building glint in response to sun and movement. Internally, the top four levels comprise a flexible mix of 97 one- and two-bedroom apartments above a two-level podium of parking and more than 1,100 square feet of retail space. The Wheeler District’s Cottage Series homes are unlike any residential product in the metro area. The twelve cottages front on Pedaler’s Lane, a pedestrian street, and range in size from 650-1250 square feet. With simple, clean lines and custom elevations and floor plans, the cottages are designed to efficiently use space and create connections between neighbors. The home exteriors feature a variety of materials including brick, Hardie siding and cedar siding. Aluminum-clad wood windows dot the exterior elevation and 5V metal flanks the roof. Bisecting Pedaler’s Lane is Runway Boulevard, a tree-lined street that outlines the former runway of the historic Downtown Airpark. Runway Series homes along the boulevard are currently under construction and range in size from 1500-3000+ square feet. Wherever possible, dedicated parking is located in the rear of homes so that porches, not garage doors, frame the street. All Runway homes have private courtyards and a geothermal HVAC system. 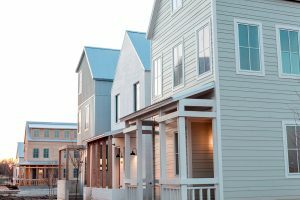 These homes are the beginnings of the Wheeler District community which will grow to include a variety of housing, restaurant and retail spaces. 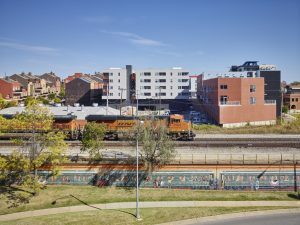 The first phase of construction will include 60 single family homes, 100 apartments, and 30,000 square feet of commercial space containing new restaurants, a microbrewery, and a range of live/work townhomes. The design for the Wheeler District was created in July of 2014 during a one-week public charrette—a collaborative process that brought together the urban designers and architects of Dover Kohl & Partners, the Wheeler development team, and hundreds of community stakeholders. The resulting master plan set the community vision for the creation of Oklahoma City’s next great urban neighborhood. The design is compact, mixed-use and dedicated to prioritizing pedestrians and cyclists, with generous sidewalks, integrated bike paths and narrower, safer streets. The Wheeler District is intended to include a broad range of home choices, including cottages, townhouses and larger single-family homes. 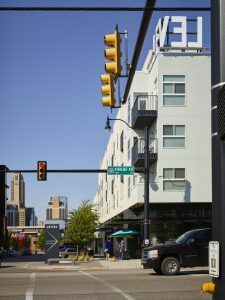 With plans for over 600 homes, 1,500 condos and apartments, and 300,000 square feet of restaurant and retail space, Wheeler represents the creation of an entirely new urban district. With downtown views and bold shades of blue, the contemporary Orthodontic Arts office space effortlessly embraces the lively and urban Midtown vibe. At the center of the whimsical and engaging space is a colored glass and mirrored cube that serves as a visual exclamation point for the office. The Cube is clad in an array of mirrors, acid-etched glass, and bright blue back painted glass. The Cube houses the “on-deck” waiting area, complete with perforated ceiling panels, televisions, and gaming consoles. The Lab and 3-D imaging equipment are also nestled within the Cube, providing easy access for the staff to the adjacent exam chairs and consultation rooms. Many rooms and functions needed to be configured to work within the constraints of the leased space. For instance, the waiting room becomes a multifunctional space; part sitting area, part art gallery for local artists, and when the interior translucent overhead door is raised, the breakroom and waiting room combine to provide a larger area for seminars and after-hours functions. 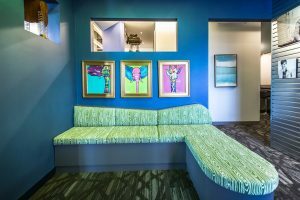 The close collaboration between Dr. Birdwell and Bockus Payne throughout the design process and construction resulted in a space that is extremely functional for the staff of Orthodontic Arts but also provides a lively, fun experience for patients, young and old.